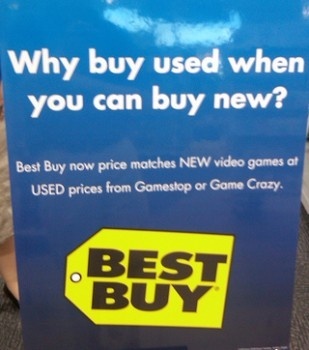 Best Buy and Toys R Us have joined Walmart in taking another run at the used games market, but industry analyst Colin Sebastian thinks these new programs could do more harm than good to big box stores. Thar's gold in them thar hills - pre-owned videogame gold, that is, and everybody wants their share. Walmart revealed on Monday that it's testing a comprehensive new program for used games with a "start-up services provider" called Game Trade and now it appears that fellow big-box operators Best Buy and Toys R Us are also looking into new ideas for used game sales at a few of their stores. Specifics aren't available, but Colin Sebastian of Lazard Capital Markets said he doesn't expect any of the new initiatives to have much of an impact on the dominance of GameStop, the big dog in the used games fight. "Given the lack of success of other pre-owned game initiatives, we don't view these new initiatives as posing a clear threat to GameStop," he said in a statement. "The barriers [to] establishing a liquid and profitable used video game business are fairly high, including dedicated systems to track and manage used inventory and pricing, the ability to refurbish products and restock stores to balance supply, and compliance with numerous municipal codes," he continued. "While the third-party companies likely have these core competencies, we note that they will not be as tightly integrated as what exists across GameStop's network of thousands of stores." In fact, Sebastian believes that regardless of their success, the biggest impact of these pre-owned programs could be to cut into the sale of new games. "We believe that the new big box initiatives could have a bigger negative impact on sales of value-priced new software, which are traditionally sold to 'mass market' consumers through the discount big box stores," he added. The beefy profit margins of used videogames is obviously attractive but can retailers like Toys R Us and Walmart come up with the expertise necessary to be effective in what is inherently a very fluid and subjective market? I bet there are at least a few high-placed videogame executives who are hoping very much that the answer is "no."